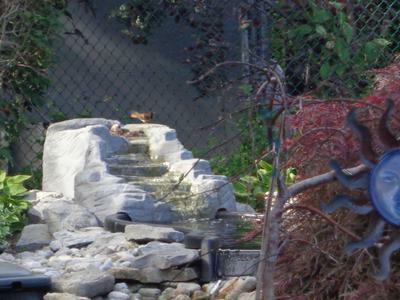 While relaxing in my backyard and watching the neighbourhood birds bathing and drinking from my pond waterfall in Hamilton on a Saturday afternoon, along came a small black and orange bird, which I thought might be some kind of a Wren. It was nervously hopping and changing directions with his tail feathers slightly pointing upward, took a bath. I caught him with these pictures and thought someone might know what he was. Thanks for the info and picture - I don't know what this might be, but perhaps one of our readers will know.